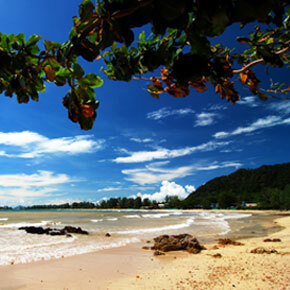 Ko Lanta has two seasons; summer and rainy which effect by monsoon. The East monsoon start around Octorber which will bring the perfect weather, cloundy sky and crystal claim seas. The West monsoon start around June bringing onshore wind with rougher sea and more rain. The weathers stays average about 30 degree C with humidity whole year. The typical wheather is perfect during November till to April. The visiter numbers peak in December till February. Rainy season, there are not much rain during the day. The everage is just a few hours and not everyday mostly at the night time. The a bit heavy rain period is during September to August but it the same for just a few hours and not everyday. Many visitors come to Ko Lanta in 'rainy season' as there are fewer visitors and the overcast afternoons allow beach walks and island exploration without strong direct sunshine. Klong Dao Beach Photo of the rainy season.